Starting a Cycle CountFirst you should log into the scanner application and select Cycle Count Mode from the main menu. Cycle countOnce you have logged in scan the location that you want to cycle count. The scanner will ask you if you want to begin a cycle count for this location. 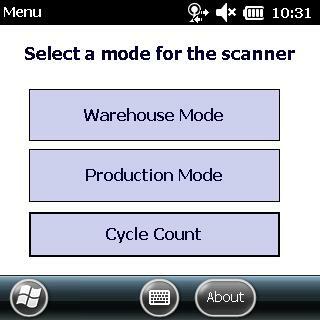 Began scanning the containers that … Continue reading "Cycle Count"
Scanning a BPR (Batch Production Record)First, you should log into the scanner application and select Production Mode from the main menu. Once you have entered Production Mode. Scan a BPR bar code from your printed documentation in Virtual Office to begin adding containers to the BPR. Scanning the BPR will cause the scanner to load all … Continue reading "Production Mode"
Scanning ItemsSteps to use Warehouse mode on a Windows scanner.First, you should log into the scanner application and select Warehouse Mode from the main menu. Adding a container to the scannerOnce you are logged in and have selected Warehouse mode a screen will show allowing you to scan a batches container. Scanning a batch sticker for … Continue reading "Warehouse Mode"